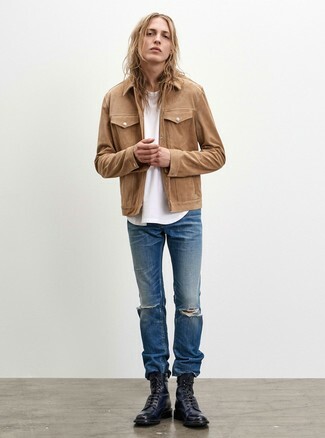 If you're on the hunt for a casual yet stylish outfit, wear a tan shirt jacket and Calvin Klein Jeans tapered rip and repair jeans. These pieces are totally comfy and will look incredible together. Channel your inner Ryan Gosling and choose a pair of black leather casual boots to class up your outfit. 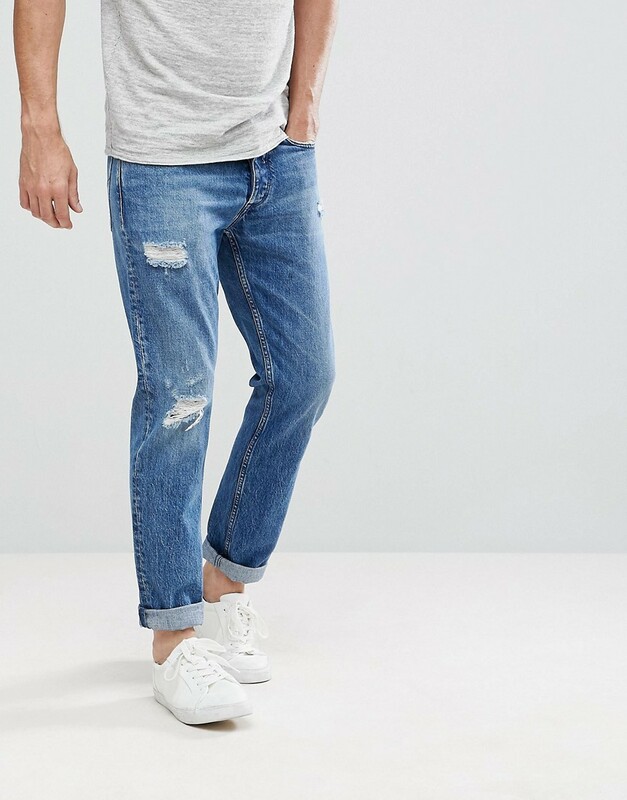 If you're all about feeling relaxed when it comes to piecing together an outfit, this combination of a blue crew-neck sweater and blue ripped jeans is just what you need. You could perhaps get a little creative when it comes to footwear and lift up your outfit with dark brown leather loafers. If you're in search of a casual yet stylish outfit, wear a navy vertical striped blazer with Calvin Klein Jeans tapered rip and repair jeans. As well as totally comfy, these two items look incredible when worn together. To add more class to your ensemble, round off with dark brown leather derby shoes. If you appreciate practicality above all, team a dark green barn jacket with blue ripped jeans. If you're a fan of comfort dressing when it comes to fashion, you'll love this on-trend pairing of a navy print bomber jacket and Calvin Klein Jeans tapered rip and repair jeans. If you don't want to go all out formal, choose a pair of navy canvas sandals. 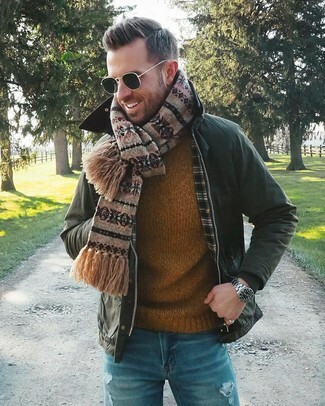 Pair an olive cardigan with Calvin Klein Jeans tapered rip and repair jeans to be both killer and relaxed. Kick up the cool of your getup by finishing off with brown leather loafers. 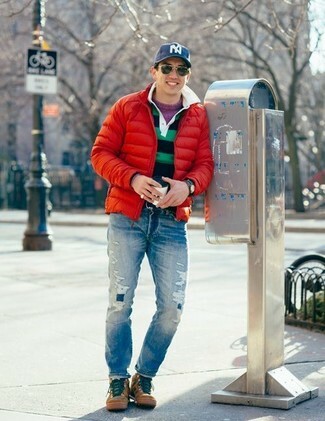 If you're in search of a casual yet stylish outfit, wear a red puffer jacket with Calvin Klein Jeans tapered rip and repair jeans from Asos. These garments are super comfortable and they also look wonderful when paired together. For something more on the daring side to complete this look, choose a pair of brown athletic shoes. 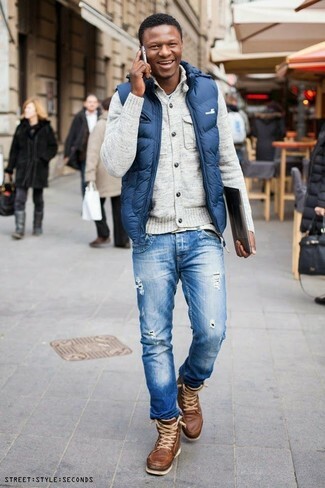 Make a blue gilet and Calvin Klein Jeans tapered rip and repair jeans your outfit choice to be both casual and knockout. For something more on the daring side to round off this look, make brown leather work boots your footwear choice. 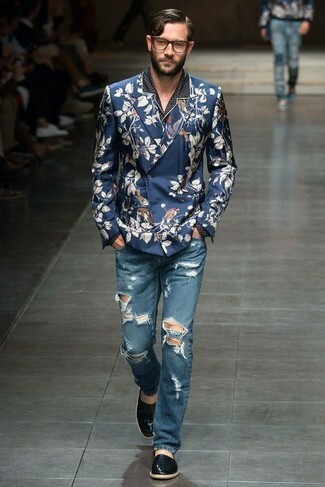 If you're on a mission for a casual yet on-trend getup, wear a blue floral double breasted blazer and Calvin Klein Jeans tapered rip and repair jeans. Both of these pieces are totally comfy and they also look amazing when paired together. When it comes to shoes, this look pairs well with black leather espadrilles.